Although the world championships course in Austria favors grand tour stars, Chris Froome and Geraint Thomas opt out of racing. 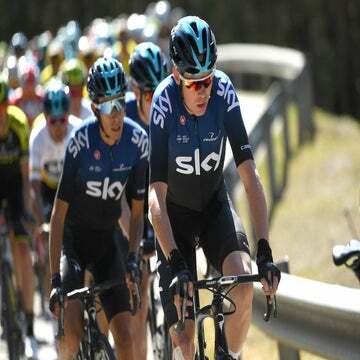 LONDON (AFP) — Team Sky’s Tour de France winners Chris Froome and Geraint Thomas will miss this month’s road world championships in Austria after a grueling season in which they both won grand tour events, Team Sky has confirmed. Team Sky sport director Brett Lancaster confirmed the British riders would not be competing at the event in Austria, which starts on September 22. Lancaster spoke to reporters at the Tour of Britain. Froome and Thomas have historically struggled at the world championships road race, which marks the bookend to the racing season. Thomas was a DNF in the men’s road race in 2013, 2014, and 2016, while Froome failed to finish in 2012, 2013, and 2014. Froome’s third place in the individual time trial in 2017 marks the only podium finish at the elite road world championships between the two. The Austrian world championship course marks a rare opportunity for grand tour riders like Froome or Thomas to shine. The mountainous course includes approximately 5,000 meters (16,040 feet) of total climbing. Grand tour winners such as Vincenzo Nibali (Bahrain-Merida) and Alejandro Valverde (Movistar) are favored on the course. Lancaster hinted that Froome and Thomas may need some mental rest after a long season.